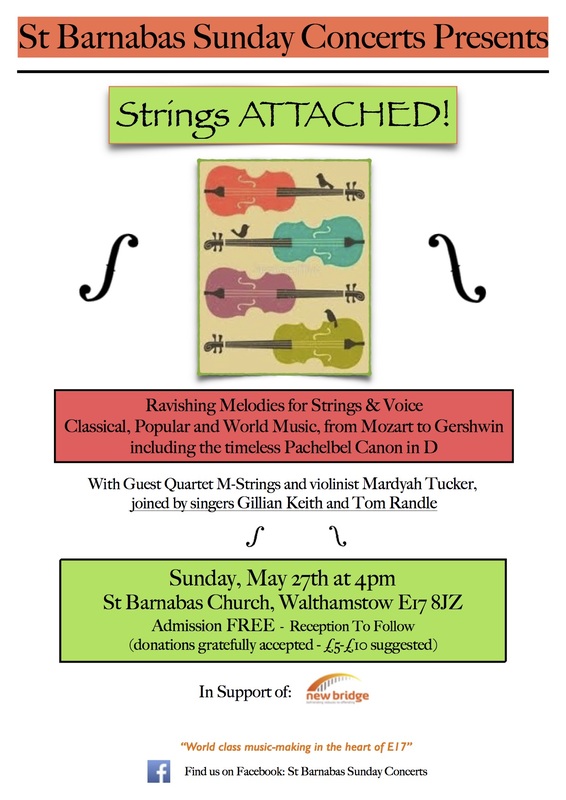 "World Class music-making in the heart of E17"
St Barnabas Sunday Concerts is a regular series of professional music events, bringing world class artists to the heart of E17. 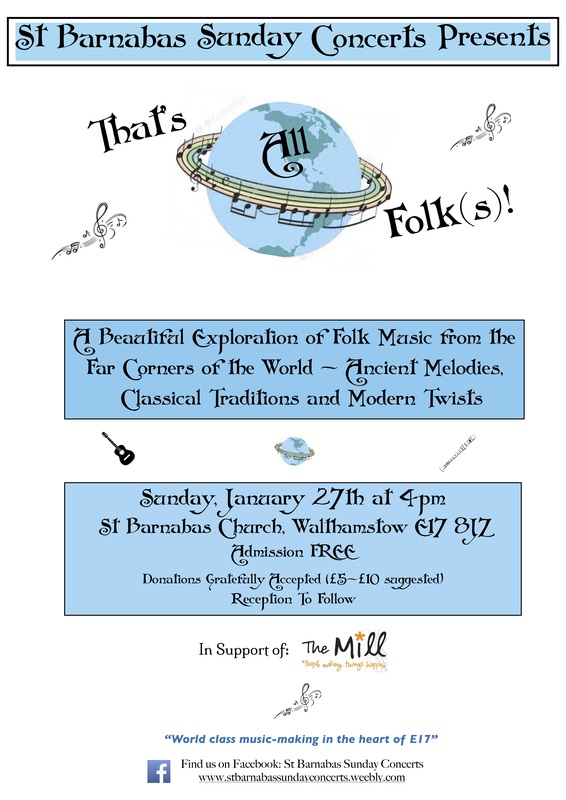 Enjoy beautiful and exciting performances of a variety of musical styles in the rich acoustic and magnificent surroundings of one of Walthamstow's most impressive and historic buildings. 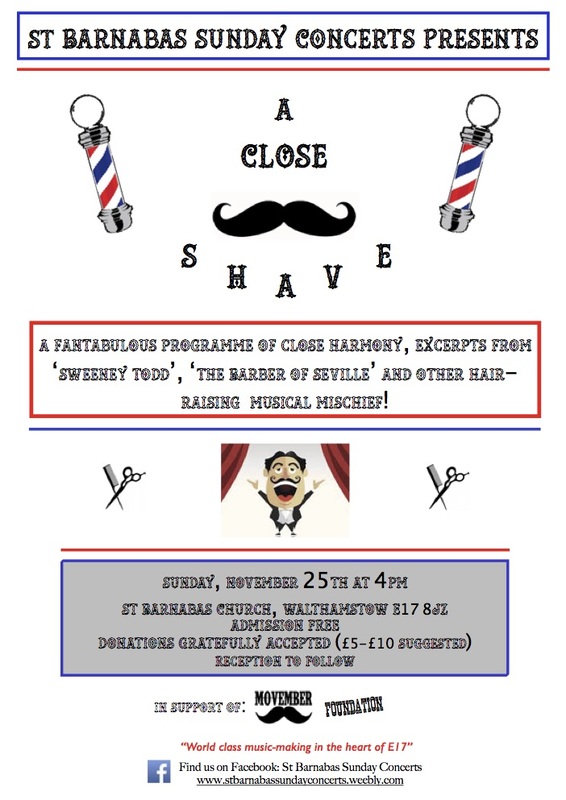 Admission is by donation, with proceeds going to selected local and national charities, making these concerts both excellent value for money and a true community endeavour. We welcome some of the UK's finest classical music talent to our series, making each concert diverse, informative and entertaining. 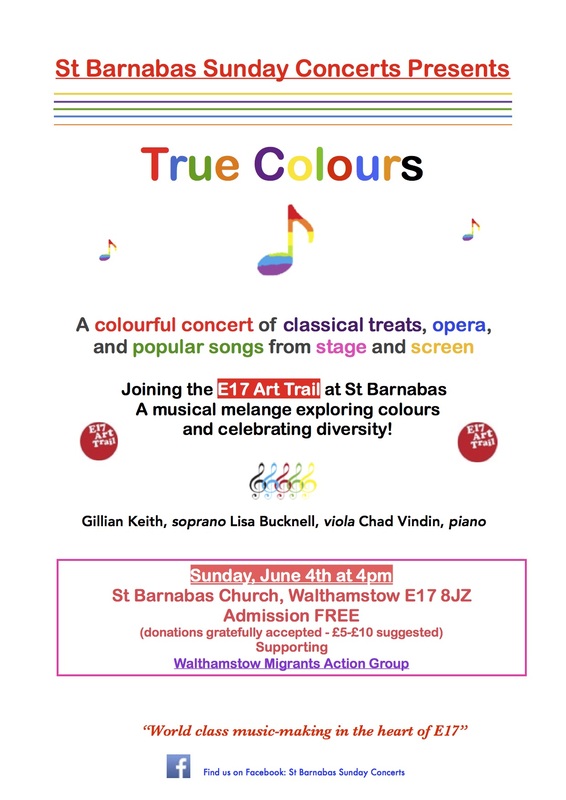 We are enormously grateful to St Barnabas, Walthamstow and Father Steven Saxby for their strong support, without which these concerts would not be possible. 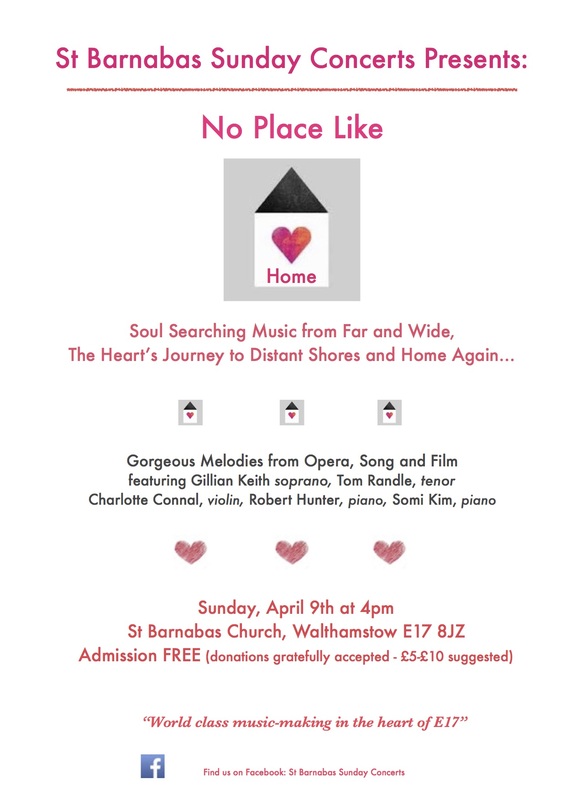 About the founding artists: Gillian Keith and Tom Randle are professional opera singers who have lived in Walthamstow for 13 years. Their creative talent and belief in community spirit has fuelled a desire to establish an accessible, high-quality musical experience to complement Walthamstow's vibrant and unique cultural life. 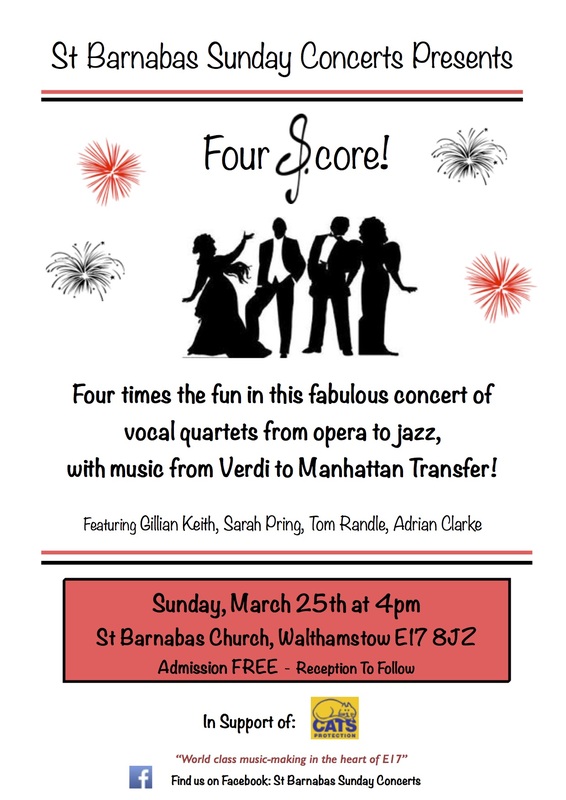 St Barnabas Sunday Concerts presents five events each year, with concerts every other month between September and May. Click on the links below to see our current season flyer and further details of our next scheduled programme. 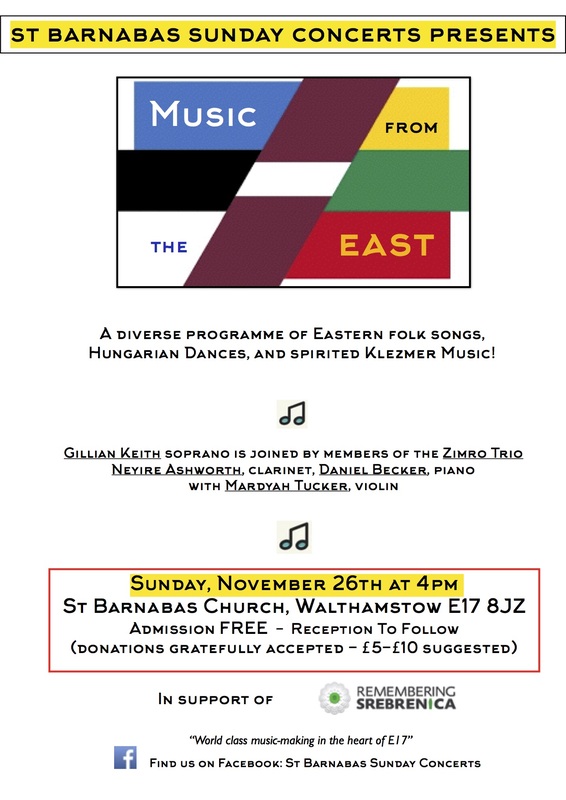 St Barnabas Sunday Concerts presented its first event in December, 2015. Since that date we have put on over 15 concerts, each with its own theme, new guest artists, supported charities and innovative musical programme. At each event we support a different local or national charitable organisation. 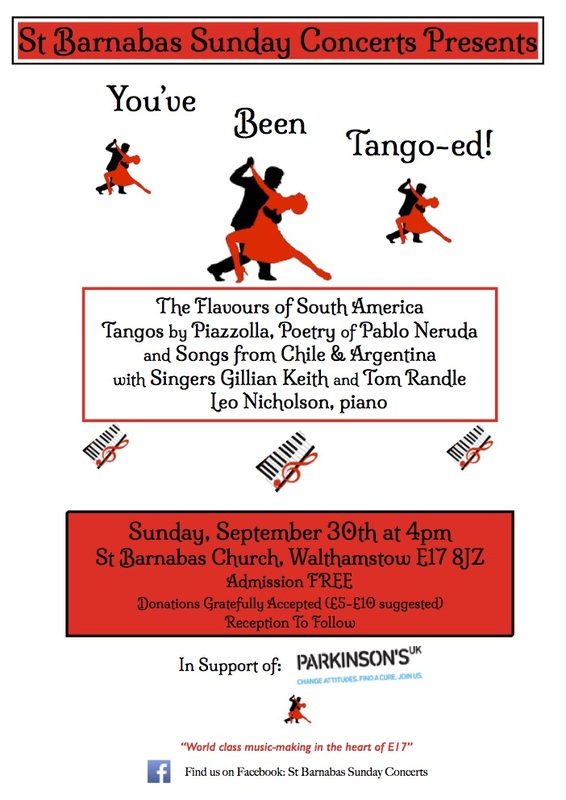 Over the years we have raised money for more than twelve charities, including the MS Society, Cats Protection, Waltham Forest Night Shelter and Remembering Srebrenica. See our COLLABORATIONS page on this site, or click below for details of charities we have supported. Many talented colleagues have appeared in our concerts. Click below to see a list of all our past guest artists and learn more about their work. Click to see a map showing our location, as well as links to social media and an email contact form.